In the plain to east of Bologna we find Mordano, the ancient "Moretano", with the beautiful twin towers to the entrance of the old town that remind those of the arsenal of Venice: You can reach it after having crossed a rich and worked "like a garden" country. Between the rows of vines and peach-trees you discover numerous buildings of value, typical of the rural architecture of Romagna. 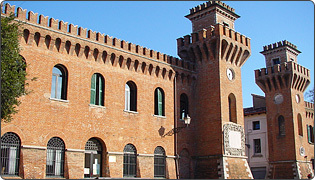 The organization of the territory, in the municipality of Mordano, has been conserved in the centuries. The Romans, once occupied the Po Plain beyond twenty-two centuries ago, to their takeover executed reclamation works, levelling of the land and regimentation of waters with the construction of roads and pits in conformity with the centurial weft. The procedure used for the subdivision of lands comes defined "centuriazione" and is obtained designing an orthogonal square mesh reticulum in which every squared (century) is divided in one hundred plots of ground of two jugers everyone (approximately average hectare) exactly called centuries. The limits of the meshes are called decumanus (East-West) and hinge (North-South) and normally they coincide with roads, paths, draining pipes; more rarely with dividing walls or other instruments right for the delimitation. The limits were functional and cadastral lines that confer to the landscape an aspect of geometric order. In Emilia-Romagna the reference decumanus is always Via Emilia, the hinge in Imola’s countryside is represented from Via Selice. In Mordano’s lands the mesh of the centuriazione is still very visible. The Mordano’s territory, in fact, already completely centuried towards the 150 a.C., has maintained in the time the formulation of roman origin almost unchanged. Subjected in the 1152 from people coming from Bologna, the municipality was object in the following years of sour arguments that had for protagonist the neighbouring Imola. To the end of the 1200's it was Maghinardo from Susinana to take possession of Mordano, that then he left to his friend Matteo Ragnolo. It was then the time, towards the half of 1300, of Della Bordella from Imola, to which they followed the dominions of the Milanese, of the Venetians, of the Manfredi from Faenza and finally (in 1475) of Girolamo Riario, grandson of Pope Sisto IV, to whose death the municipality passed to Caterina Sforza. This last one fortified the country, but she had to surrender in 1494, to the French of Carl VIII. They followed, in the XVI century, new spillings of blood, since the municipality endured the offensive of Giovanni Sassatelli, the Cur, angered for the support that Mordano had come to an agreement to the Vaini family. Finally the municipality passed under the government of the Church, until the arrival in Romagna (1796) of the Napoleonic troops. Of 1802, finally, it is the last official act of the independent Bubano’s municipality, that from then it met in Mordano’s municipality. After the end of the papal power, the Governor of the Romagna Luigi Carlo Farini, on the 27 December 1859, redefined the territorial districts combining Mordano’s municipality to the Province of Bologna.